Kurt Warner's unlikely road from grocery store stocker to Super Bowl champ—and now the Hall of Fame—is one of the best known stories in football. 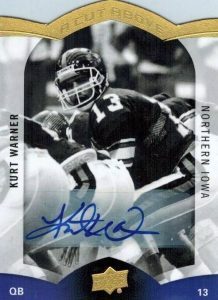 As such, Kurt Warner cards are an appealing choice for many collectors. Although eligible for the 1994 draft, Warner wouldn't get a proper NFL card until 1999. 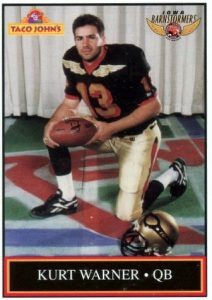 However, fans of pre-rookie cards can find Arena Football League releases from his years with the Iowa Barnstormers. This list brings together Warner's best football cards including several rookie-year autographs. A native of Iowa, Warner played quarterback for Northern Iowa in college but went undrafted in 1994. Briefly part of the Green Bay Packers' practice squad, Warner found success in the AFL with the Barnstormers. While there, he eventually attracted the attention of the St. Louis Rams, who signed him in 1998. 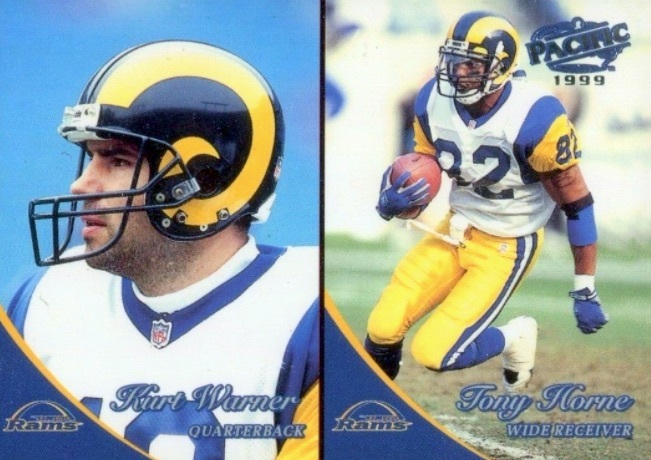 After playing in NFL Europe, Warner guided the Rams to a Super Bowl victory and was named the 1999 MVP. He would ultimately reach three Super Bowl games and brought playoff success to the Arizona Cardinals later in his career. 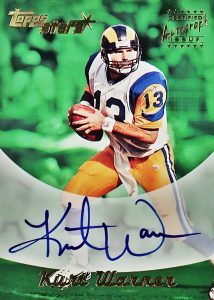 Shop for Kurt Warner autograph cards on eBay. 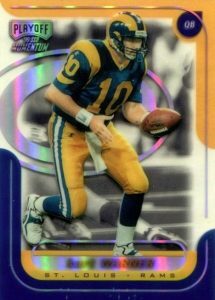 While one of the Kurt Warner cards from his Barnstormers' days made the list, collectors can find two additional choices from the 1996 and 1997 team releases. 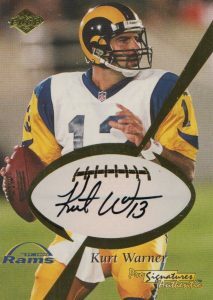 Switching gears, many key Kurt Warner autographs are limited so they are rarely available to collectors. This includes a combination autograph with Dan Marino in 2000 Donruss Elite and an autograph card in the 2000 Quantum Leaf set honoring Warner's Super Bowl MVP performance. Although Warner took Arizona to a Super Bowl, there are relatively few certified autographs featuring him in a Cardinals uniform. Two more recent sets with his Cardinals autographs include 2014 Panini Absolute and 2015 Panini Clear Vision. Warner has also been paired with many other great quarterbacks on dual autographs. 2002 Topps Co-Signers finds Warner with his Super Bowl XXXVI opponent Tom Brady while 2009 SP Authentic has a combination autograph with his Super Bowl XLIII opponent Ben Roethlisberger. In addition, Warner was briefly Brett Favre's teammate in 1994, and both players are included on a 2002 Topps Stadium Club autograph. Helping form the "Greatest Show On Turf," Warner and Marshall Faulk were featured together on an autograph card in 2015 Panini Immaculate Collection. Warner's selection to the Pro Football Hall of Fame cements his legacy as one of the greatest undrafted players in history. In building a Kurt Warner card collection, collectors should try to add cards from each part of his football career. Nevertheless, his earliest cards tend to be his most popular. Although card value was the main component used in compiling this list, design and availability were also considered. Click on the images or listings below to shop for cards on eBay. Linked sets go directly to detailed profiles. For college football fans, 2015 Upper Deck Football includes a die-cut Warner autograph from his days with the Northern Iowa Panthers. The design is a throwback to the popular A Cut Above inserts from the Upper Deck sets of the 1990s. Warner's college, located in Cedar Falls, Iowa, plays in the Missouri Valley Conference. He was named the conference's Offensive Player of the Year in his final season. Other modern Kurt Warner autographs offer more variety, including premium signed inserts from Flawless and National Treasures. A budget-friendly Kurt Warner rookie can be found in 1999 Playoff Momentum SSD. The card was printed on a transparent acetate that allows you to actually see through the card. Turning the card over, you get a mirror image of the front with Warner likely about to hand off to Marshall Faulk. The reverse side also features Warner's stat line from 1998 which found him playing in just one game. Warner is seen rolling out to his right on his 2000 Topps Stars autograph card that features a green background. The on-card design offers a substantial signing space and Warner's large autograph is the clear highlight. Warner signs with a very readable script and the signature is dominated by the oversized "K" and "W" of his first and last name. The "K" is known for its curl at the top and loop in the middle while the "W" has round curves at the bottom of the letter. As the name implies, 1999 Skybox Premium was a higher-end football release and was available only through hobby stores. The set is known for its rookie inclusions on the checklist that feature a common and uncommon version for each player. Although Warner wasn't included in the base rookie set, he was featured in the Autographics insert. The well-known line includes a standard autograph version and a Red Foil parallel, hand-numbered to 50 copies, which looks more pink than red. Along with the standard rookie card in 1999 Fleer Focus, the Stealth parallel is much more rare with only 300 copies. The key difference is the color of the foil "Focus" in the upper corner of the card as the standard version is red and the Stealth version is green. The Stealth parallel is also serial numbered. The reverse side of the card highlights Warner's amazing opening stretch as a starting quarterback where he set an NFL record by throwing three touchdowns in each of his first three games. The Kurt Warner autograph card in 1999 Collector's Edge is one of his more beautiful early signature appearances. The design incorporates a white football in the center of the card that serves as the signature area. Warner also added a "#13" inscription, which is the jersey number he wore in college, the AFL, and the NFL. His Collector's Edge Pro Signatures Authentics card is limited to 500 copies and each card is hand-numbered in black ink on the back. 1999 Bowman's Best offers Kurt Warner rookie cards for collectors at every budget point. Collectors on a tight budget can look for the standard Warner rookie which is printed on a thick chromium stock. Mid-range collectors may track down the Refractor version below, numbered to 400 copies, which features a rainbow effect. Meanwhile, big-budget collectors can zero in on the Atomic Refractor that has a slightly different look and a print run of just 100 copies. This 1999 Pacific Football rookie is perhaps the best indication of what the football world thought of Warner's NFL prospects. 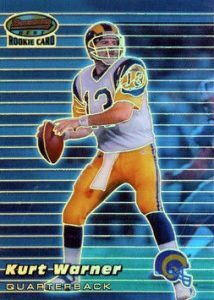 Instead of getting his own card, like many top players did, he shares it with Rams wide receiver Tony Horne. 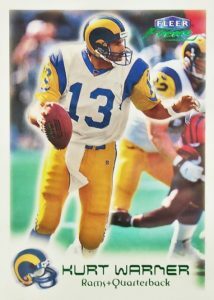 During his first season with the Rams, Warner was the third-string quarterback behind the unlikely duo of Tony Banks and Steve Bono. The Mexican restaurant chain Taco John's was the surprising sponsor for Iowa Barnstormers AFL trading cards. The 1995 set has become famous for featuring one of Warner's earliest cards. It feels a little unusual seeing Warner in the brown and gold uniform of the Barnstormers but the card is a great oddity for a career that took considerable time to progress to greatness. Warner excelled in the AFL, guiding the Barnstormers to back-to-back ArenaBowl appearances, which is the league's equivalent of the Super Bowl. 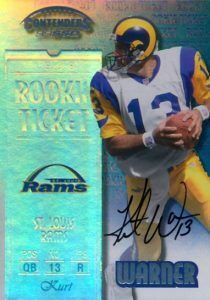 Warner's Rookie Ticket appearance in 1999 Playoff Contenders is his only autograph that is also considered an official rookie card. 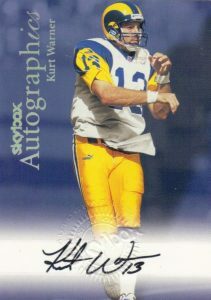 Undoubtedly the key Kurt Warner rookie card, it is also one of his most plentiful autographs. He signed 1,825 copies for the standard version, although the cards themselves aren't serial numbered. Gem-mint graded copies of the main edition can top $400 at auction. Collectors with more spending power can look for the Speed Red (#/100), Powder Blue (#/50), and Finesse Gold (#/25) parallels. While working at a hotel that had Kurt’s team stay at when coming to play the Carolina Panthers, when he came down to get on the bus to take them to the game he walked over to where we stationed off autograph searchers and he reached in his pocket and gave a small stack of cards out. It was one HE personally made, not autographed, but very unique. It actually had a small picture of an xray that showed his broken finger and he has his birth date on it as well as a BORN AGAIN date on it. He always carried a bible with him. Just a class act, not sure what this card is worth but for now…it’s not for sale!!!! !